Hundreds, perhaps thousands, of #RevolusiLangitBiru protesters gathered in Riau to make their voices heard against the annual haze pollution. Singapore’s consumer association said on Monday that it had received sustainability pledges from 38 of the 3,000 companies to whom it had written. The Indonesian social affairs minister said the ministry had forwarded compensation proposals from six of seven provinces to the Finance Ministry. A new civil action group staged a protest against deadly haze pollution in the capital of Indonesia’s Riau province on Monday. The Riau Pos newspaper reported hundreds demonstrated against the smoke outside the governor’s office on Monday. Calling themselves the Revolusi Langit Biru, or Blue Sky Revolution, the group circulated posters on social media calling for people to come onto the streets dressed in blue. By afternoon, some on Twitter said there were thousands at the event. The hashtags #MelawanAsap, #ResistHaze and #RevolusiLangitBiru both picked up Monday, with the latter becoming a trending topic by afternoon. The governor declared a state of emergency in the province on September 14, but anger in Riau and other Sumatran provinces has swelled as deaths from respiratory disease continue to be reported. Social Affairs Minister Khofifah Indar Parawansa said the ministry has forwarded compensation proposals from six of seven provinces to Indonesia’s Finance Ministry. Anyone possessing a card demonstrating low-income status, known as KKS in Indonesia, will be eligible for a one-off 900,000 rupiah (around $67) payment. President Joko “Jokowi” Widodo has approved the payments, the minister said, but bureaucratic delays are ubiquitous in Indonesia and it remains unclear when KKS holders will receive the money. #RevolusiLangitBiru rally coordinator Budi Utama told Riau Pos the Blue Sky Revolution was preparing a class action lawsuit from those affected by the haze. “We’re also assisting the government in distributing masks to the public in urban districts in Riau,” he said. A photo from the demonstration in Pekanbaru was posted on Twitter. To the north of Riau, an alliance of residents in the semi-autonomous Aceh province prepared a class action lawsuit of their own against the government over a spatial plan that omits Leuser, one of the world’s last great ecosystems. 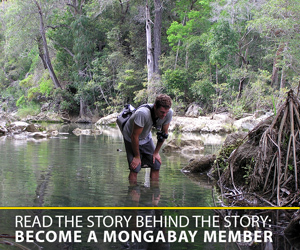 “We don’t want Leuser to become like Riau and Jambi, with all these fires,” a representative of the plaintiffs told Mongabay. Aqua and Terra satellite data showed 90 hotpsots at 5 a.m. on Monday morning, 65 of which were in South Sumatra. Data published by the Malaysian government showed one part of the country registering unhealthy air, with the remainder recording either “moderate” (39) or “good” (11) air quality. Air quality in Singapore worsened slightly by Monday afternoon as southeasterly winds nudged the Pollutant Standards Index into the low end of the “unhealthy” range. The city-state’s consumers association said on Monday it had received pledges from 38 firms so far on the sustainability of their supply chain. The association has written to more than 3,000 companies. Meanwhile, Malaysian Prime Minister Najib Razak arrived in Jakarta on Sunday on an impromptu visit to discuss the two countries’ joint palm-oil council and the haze. Najib, who is fighting serious corruption allegations at home, was quoted by Malaysia’s New Straits Times as saying Jokowi was “embarrassed” by the haze. Praise be to God I have safely arrived in Indonesia for a meeting with Jokowi. There are many matters to be dealt with. 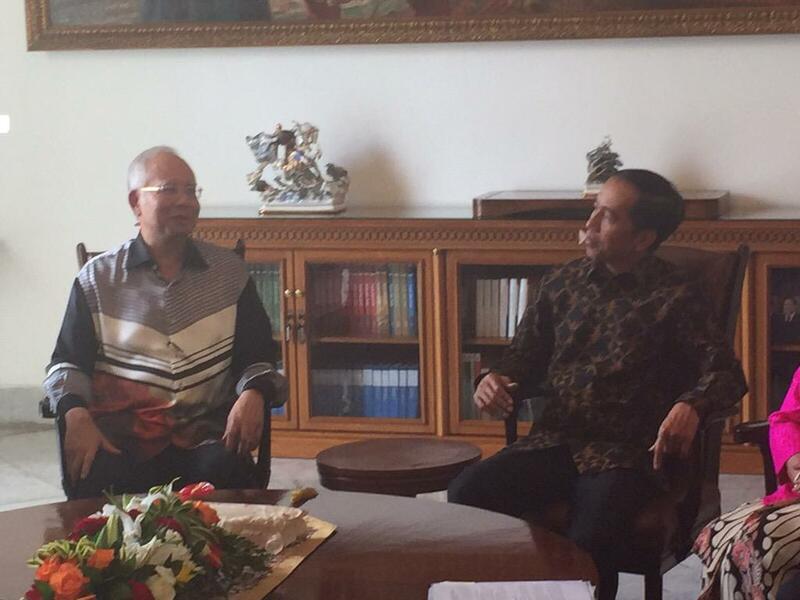 Najib (left) and Jokowi are shown in Jakarta on Monday in a photo posted to Najib’s Twitter account. 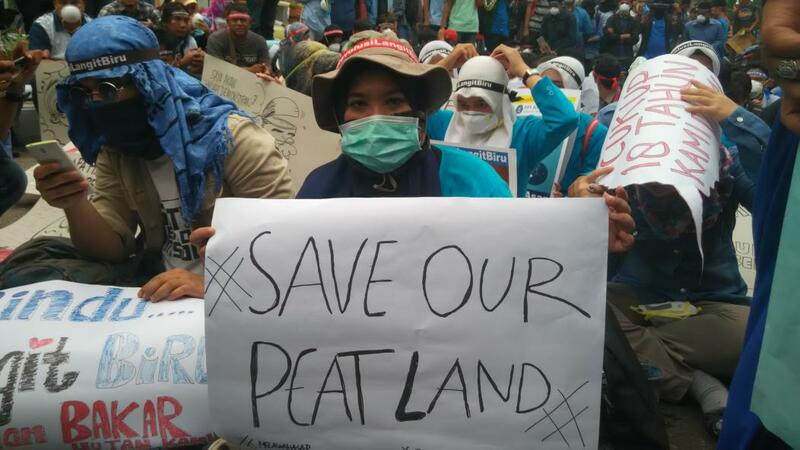 Najib is pressing Indonesia to use tube wells to prevent peatlands from burning, in addition to a series of canals.